Well I officially decided to play TTW without getting either of these perks as they're kinda semi cheating, and make planning characters, and character builds generally pointless, something I found interesting/fun on Fallout New Vegas, but Fallout 3 really didn't have because of these Broken Perks. I say Broken intentionally as well as they make any perk that increases SPECIAL pretty much pointless, including a lot of perks you earn later in the game including from Old World Blues, and Lonesome Road, let alone Grayditch's Ant Might/Sight Perk. They also make getting the Implants pointless on top of that. I know the option of "Not" Selecting these Perks is a valid argument. However, perhaps having an "Optional" similar to other "Optional MCM" addons would be a nice touch for people who do not want the "Temptation." So Far I held Fast this play through and I've enjoyed it thus far. I have reasons to Pick up SPECIAL bobbleheads early on as well when I run into them going "Ooh." Instead of breaking immersion waiting until after I hit lvl 30. I also noticed that if I do not get these Perks, it's actually impossible to get 10 in every SPECIAL category without using clothing/items or using Specific Traits like Four Eyes and Small Frame. Getting those two Traits on top of all 10 Intense Training + Bobble Heads + Implants + Quest Perks actually add up perfectly if done right to 10 in every single category without using clothing/gear. Which is kind of a funny Unintentional Coincidence. Rebalancing the Perks and make them function similar to Intense Training. But with more Perk Points instead of just 1. Say No Weakness Provides 3 Perk Points, while Almost Perfect Provides 4. Equaling the missing 7 you would of gotten from the Bobbleheads, allowing someone who gets Four Eyes, and Light Frame the chance to still achieve a Perfect 10 Across the Board. You could provide conditions like No Weakness Requiring Rank 8 Intense Training or Higher to get, while Almost Perfect would Require No Weakness to get. Basically meaning these Perks will only be accessible for people literally going for Perfect SPECIALs. Though my calculations could be wrong. But when I was pad and papering SPECIALs and all Perks/Traits that provide Specials (including Implants/Bobbleheads) I did come out with a Perfect 10 Across the board, if you spread them out accordingly. That being said, if this is correct, that means it's a plausible solution to these Over powered Perks. In 3.2 there are no optionals, no MCM. 3.3 update will have an ini file to enable/disable certain things, and temporary esps to enable/disable these features. Bobblehead rebalance are integrated, only exception now is Charsima, which will work like it did in F1/2 and control how many companions you can hire, but is not yet implemented. They no longer give bonuses to SPECIAL or skills. The perks will not be disabled, however someone is free to make whatever mods they like to balance the game how they like. Disabling perks is a simple operation in FNVEdit. The implants are just as cheaty as the perks and quest rewards, I see no difference. That's a cool idea for a mod, I had the same idea when I played Wasteland 2. Actually the implants shows how FO3 is bad regarding skills and leveling. In FO3 you have endless skill books (25 for each skill), the bobbleheads give you each one point to every SPECIAL, you also have three ranks of skill perks and a perk that raises all of your SPECIAL to 9. I'm not even counting the fact that you chose a perk every level. You don't need to plan your character or even remove points from a SPECIAL skill to put into another one. 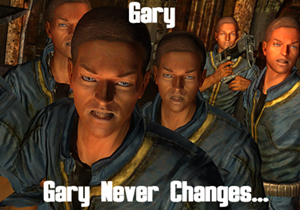 In FNV you actually have to buy the implants, they are not simply gave it freely to you and they are costly. Sure, you and I beat the game to the death and know how to farm tons of cash at the game start, but newer players don't. Before I even leave the Vault I already have 200 rounds of 10mm, a almost perfect condition 10mm pistol and tons of miscelania, resulting in entering Megaton and leaving without doing a single quest and with almost 1500 hundred caps (which I buyed a 6 DT armor). The point is, they complement your build rather than speedy you into god mode and are not simply handed to you as a stat raise. Unlike FO3, in FNV the things you got you really have to work to have them. I don't consider them "cheat". In Fallout 3 you can't have a near perfect condition 10mm pistol when you leave the vault because you can't repair above your skill level. You can't have a rock-it launcher schematic because you don't get the same skill bonuses that NV has. You don't get a bunch of pre-order bonus crap the second you enter the wasteland. You don't get 1500 caps either because the economy is not broken by over valued weapons and armor which is worth 10-30X more like it is in NV. The perks are also required to fight the stronger enemies later in the game because the weapons don't do 2-5X the DPS like they do in NV. Getting 100k caps is very easy and doesn't take long because the vendors have 7-8k caps each by the time you hit level 20 where as they never have more than around 800 in F3. Those implants are not expensive relatively speaking, and yes they are just as cheaty as the perks because of that broken economy. When you combine the fact you can repair everything perfect right out of Doc Mitchells, with that massive increase in value, and the fact that vendors have a near limitless supply of caps, along with all the things you can craft to sell, and the extra damage you do to enemies which makes ammo not very precious at all, the economy is completely broken and geared towards casual players that want to be god and king of the world. It's just a different way of achieving it than Fallout 3. Let players play the games how they want to play them, this is why we did not force any particular mechanics on players. They can use F3 or NV mechanics, and there will be mods to rebalance the economy to be more fair in the future like Fallout 3, change the speech checks to NV style, and many other things to give the player choice how they want to play the games. That's what modding is about. So if you want something a certain way, then by all means, fire up xEdit and GECK and learn to make it how you want it. Quirks are Traits though. They were inspired by Fallout Traits, they give a bonus and a penalty and can also be chosen at the start too.